Cost of living pushes up cost of government. People who complain about rising property taxes are just looking at the symptom of the problem. Taxes go up when property values rise; duh. They need to rise because it costs more to buy land for building roads. Teachers and other government employees want more when their living costs rise. They have to afford higher rents and mortgages. Rising cost of living is the underlying problem. If this house was located in Seattle real estate market, it would probably be worth over $350,000! Needless to say, they would just be buying for the lot. 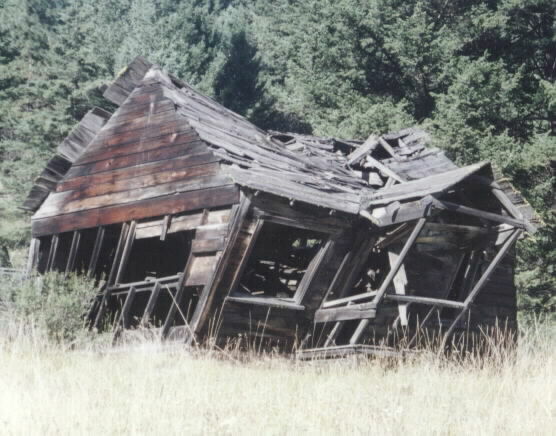 House would be torn down, if it didn't fall over first. Instead the shanty in picture was seen in 1995 on one of my bicycle tours. It was along Washington State Highway 20 between Omak and Republic, WA.